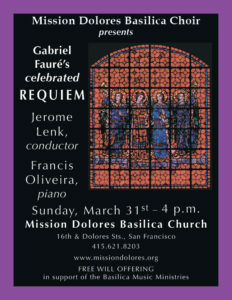 Mission Dolores Basilica Choir will sing Gabriel Fauré’s Requiem in D minor, Op. 48, in concert Sunday, March 31 at 4 pm, in the Basilica, 3321 16th Street, San Francisco. The composition, sung in Latin, is structured in seven movements. Admission is free. Donations will be accepted. Call 415-621-8203.